The HK900 operates in conjunction with our AVM2-PC and HF1130 Common Rail Pump Control Unit. This extends the Service Workshops’ capability from pump only repairs to full Common Rail System Test. The “All Makes” capability facilitates the testing of injectors from the major Common Rail FIE manufacturers Bosch, Delphi, Denso and Siemens. HK900 All Makes Common Rail Injector Base Kit including the basic injector fixturing assembly and main control box. HK901 Backleakage Measurement Kit (optional), a digital measurement system designed specifically for Common Rail injector backleakage. It measures four lines simultaneously, and provides either shot-based or time-based results according to the test requirements. It also provides temperature measurement on each line and interfaces directly with the HK900. Application kits for different injectors. Clamping of the injector under test is critical for correct performance and safety. Incorrect clamping can cause unstable results and poor repeatability at full operating pressures. The solution provides repeatable alignment and clamping. Furthermore, by clamping the injector as it is in the engine, the risk of cap nuts “blowing off” is removed (this is a real danger in unrestrained solutions). Ease of use, robustness, safety and affordability are crucial for workshop profitability. The Common Rail Injector Test System not only meets, but exceeds these criteria’s with functionality as yet unseen in other systems currently available. All test work is based around test plans which can be created and stored on the PC by manufacturer and then by part number. Hartridge™ provides a generic test plan for each manufacturer; which will give typical settings but not expected results. You can use these generic test plans to create specific test plans for particular injectors. Software control via AVM2-PC adopting a user-friendly test plan format (a software upgrade will be required for existing benches – pre version 33). Builds on the existing HF1130 All Makes Common Rail Pump Test Kit and HB378 Base Kit which are prerequisites for all Common Rail injector testing. 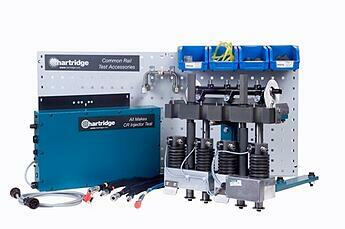 HK900 Common Rail Injector Base Kit contains an electronic control box and a 4-line injector clamping fixture. HK901 Backleakage Measurement kit for digital backleak metering (optional). Additional injector application kits contain specific fixturing parts and high pressure pipes for particular injectors. Tests Bosch, Delphi, Denso, and Siemens injectors. Tests up to 4 injectors at a time. Modular kit structure – only buy the parts you need. Fast diagnosis of faulty injectors. Rail pressure control: closed loop control using surrogate pump. Injector control: generic current, voltage, and pulse width settings are supplied for existing Bosch, Delphi, Denso, and Siemens injectors. Rigid, aligned injector clamping fixture. Backleak flow measurement: mm3/stroke or mm3/sec depending on test requirement (specific to HK901). Backleak temperature measurement (specific to HK901).